Congratulations to Clever Pup, winner of this weekend's Person-of-Mystery contest! She correctly identified Bela Lugosi as the person in the stylized photo. 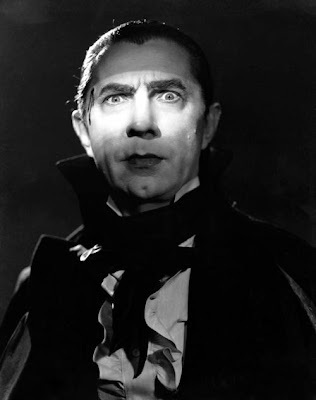 Lugosi is obviously most famous for his early screen portrayal of Dracula. In fact, Lugosi played Dracula so well, that his face is probably what most people identify as the perfect Dracula. Unfortunately, for his career, this led to Lugosi being typecast as the evil villain in many of his films. 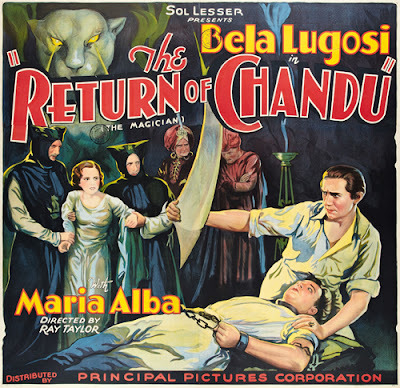 Perhaps a notable exception was his role as the romantic and heroic Chandu the Magician in "Return of Chandu," co-starring none other than my great-uncle, Dean Benton, as Bob Regent. When I saw that "Cocaine Fiends" was there at the library, I also did a quick search for "Return of Chandu," but it wasn't there. I'm not in a big hurry to see the film, but if I happen across it, perhaps I'll watch Uncle Dean again. Rob from Amersfoort, cued me in that Dean also wrote the music for another film he was in, "The Shadow of the Silk Lennox," with Lon Chaney. Too bad I never knew Dean so so involved in Hollywood when I was younger, I would have probably asked him a few things. good much more nations. It will help you to modify your Viva Video for PC Before posting likely to download and install Viva Video nice.